There is definitely caution and anxiety about investing these days. The word ‘recession’ comes up every now and again as well as ‘over-valued markets’. Should you completely ignore the words? No, and it should not stop you from investing. Investing in the stock market requires understanding the business you invest in. That’s the first principle many seem to forget. There are so much noise around stocks at any moment that you need to learn how to navigate it. For Canadian stocks, Stockchase is a good tool to see what analysts have to say and what you will notice is that the opinions differ. Not helping you may think but it should be as if you see consensus, then it’s a big sign, if you don’t you need to understand the angle of the analysts. Some analysts have short term views for profits and others have long term view. What do you do with all the noise? First, do a portfolio stress-test and get use to think that way. Investing in the stock market is investing in a business with the expectations to earn a return. That’s why there is a lot of attention paid to the inverted yield curve and interest rates as investors look for a safer way to earn the return they expect. It doesn’t mean you stop investing, it means you need to understand why there could be movement in stock prices. I did some adjustments in March and I added 1 new stock. See the trades below. Took profits in Canadian National Railway TSE:CNR to lower exposure to around 5% from 6%. Took profits in Apple to lower exposure to around 5% instead of 6%. I had bought some at $155 back in January and already made 20% on the stock in March. Took profits in Enbridge TSE:ENB to pay back a small investment loan I have been holding. Initiated a position in Disney NYSE:DIS from the proceeds of Apple. I am not a big fan of consumer cyclical sector and this investment is all about their upcoming streaming initiatives. Families will flock to the Disney+ offering as an additional spend if priced right. 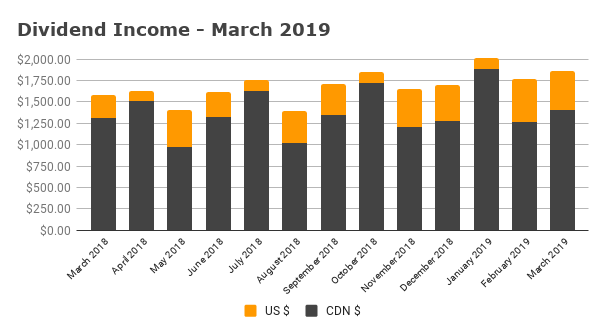 My March 2019 dividend income is $1,857. I have always tracked my US dividends as a 1:1 conversion. Why? While bills need to be paid in Canadian dollars, travel will usually cost more unless your destination is Mexico. A 1:1 conversion keeps everything safe. However, for those curious, it breaks down into the following. If you apply a conversion of 1.34, I get $613.78 for a total of $2,013.